Blistering black/death metal with melodic bridges and thrash- influenced solos, which are the synopsis for the debut full length by Infernal Execrator! Hailing from the center of Asian metal madness, Singapore, Infernal Execrator’s debut opus took almost a decade to be unleashed among the fanatic fans of black/death metal. The release entitled “Ad Infinitum Satanic Adherent” was released by Eastern Voice Productions for the distribution in Asian region. For those who are unfamiliar to Infernal Execrator’s sound, the band plays a blend of furious black/death metal in vain of early era Marduk, Angelcorpse, Impiety and so, with influences drawn from thrash metal guitar patterns. Their extremely orthodox musical influences certainly comes to a corner concluding a vicious sound.. Ad Infinitum Satanic Adherent is no different with blazing guitar riffs with some often rhythmic bridges. The guitars are prolific with some often thrash influenced solos- the solos are fast, rampant and descends ferociously to the listeners. The technical drumming intensifies the music, although the drums sound quasi-programmed, which can be considered as a minor drawback. However, for music like Infernal Execrator’s, it’s not even a big deal. The vocals require some special lines- for being the most spectacular element on this record. The piercing, passionate voice of Ashir’s shivers the spine with utter terror. The overall sound of the album is pretty clear- with satisfactory production. 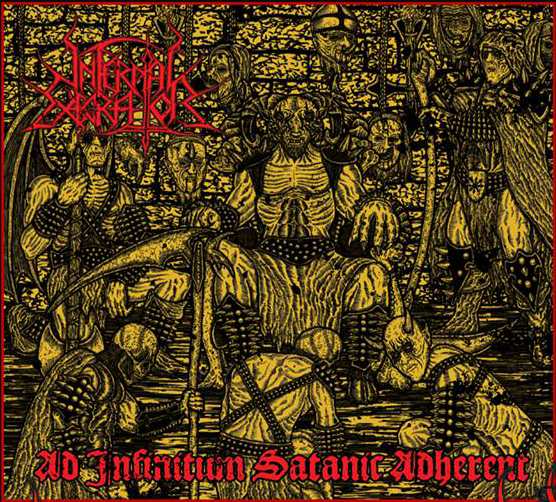 If you are to find some “raw war metal” then Ad Infinitum Satanic Adherent is not your stuff, if you are to find some solid black/death/thrash metal- Infernal Execrator’s debut is perfect for you. The release lasts for roughly 26 minutes, but it should leave a bleeding resonance to your head. Recommended. Highlights: Singatheos Regimentum Mastema– the masterful number of the release- starts off with melodic rhythm guitars before breaking out to a violent black/death epidemic. Iblisupremacy Divine Desimare – contains some solid and memorable guitar riffs, you find nowhere in the album, the track is more leaned to a thrash edge. This is the best song in the full length in my opinion. Mors Ultima Vocatio– This can be claimed as an odd track to the list- as it sounds more oriental on the punishing black metal background. An absolute stunner.